Classy Project Management Sdn. Bhd. has 10 years of experience in the kitchen furnishings & interior design industry. With years of exposure in the industry and our very own showroom & factory, and now we are able to provide you with the best aluminium kitchen cabinet. Our interior decorators and designers self-manufacture the highest quality aluminium kitchen cabinet mold that is unable to copy. 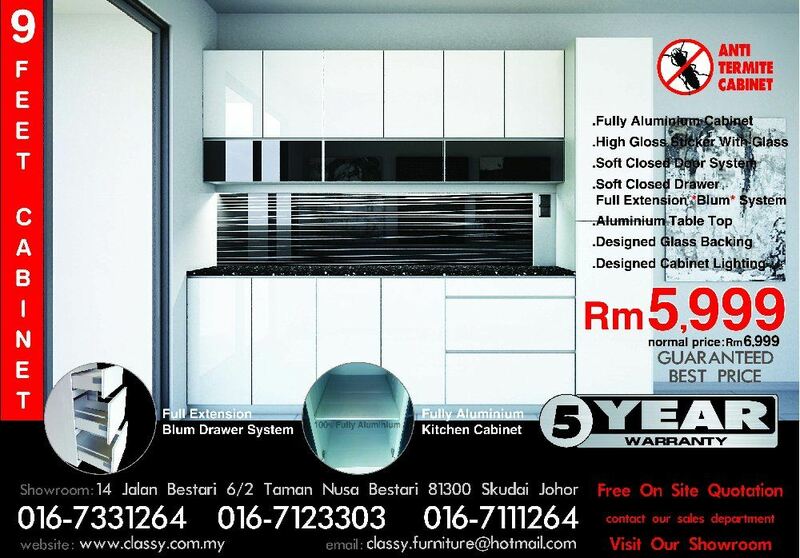 Furthermore, our product is manufacture prices, is known as the lowest prices in whole Malaysia. With a team of highly skilled and experienced professionals, we are equipped to undertake interior design and renovation projects of any size. From small scale remodeling to large-scale renovations, our focus is always on quality. Planning to give your kitchen a makeover? Explore our favorite looks and get inspiration to create the kitchen of your dreams. Classy Project Management Sdn. Bhd. has 10 years of experience in the kitchen furnishings & interior design industry. With years of exposure in the industry and our very own showroom & factory, and now we are able to provide you with the best aluminium kitchen cabinet. Upgrading a kitchen is full of possibilities, and even a few simple budget ideas can refresh, modernize, and add value to your home. Remodeling projects, such as updating decor, improving your layout, and adding storage, will better meet your family's style and needs. Our interior decorators and designers prepare turnkey packages and provide entire project management support, from procurement and budget management to delivery and installation. Our core focus is to deliver projects on time, on budget without compromising on quality. Our design advice and how-to ideas tell you everything you need to know about planning a kitchen remodel. With a team of highly skilled and experienced professionals, we are equipped to undertake interior design and renovation projects of any size. From small scale remodeling to large-scale renovations, our focus is always on quality. We are more than happy to provide you with references from our past clients. Feel free to call with any questions you might have about us or your kitchen, bath or whole house remodel.